In 2012, the movie "Snow White and the Huntsman" was released in theaters. It seized the childhood fairy tale and brought it to an adult audience. That movie focused on the evil queen, Ravenna, sending the huntsman to kill Snow White after the infamous mirror on the wall informed her there was "another destined to surpass" her beauty. 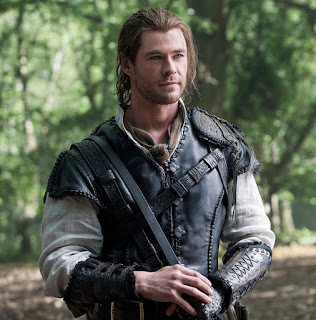 "The Huntsman: Winter's War" gives the background story of the huntsman in the fairytale. He was raised to be a warrior in the kingdom ruled by the Ice Queen, Freya, who was Ravenna's sister. The movie started a little slow. Plus, after 4 years, I found myself struggling to remember if we had ever been introduced to Freya before. However, I did finally settle into watching the drama of the Ice Queen unfold before me and frankly didn't care whether we knew the queen from Snow White had a sister. Once I was able to set that aside, I very much enjoyed the movie. Unlike her selfish sister, Ravenna, who had schemed and murdered in order to become queen and to take control of a kingdom, Freya was a sweet girl content with a more common life that included love and a family. It is well known that Ravenna, the queen, is a sorceress. We learn in this movie that her powers are not even conquered by death. Ravenna had often admonished Freya that she should seek her own supernatural powers, embrace them and become powerful like herself. When Ravenna discovered she had a new rival, her diabolical actions cost Freya everything that was ever important to her, including the life of her only child. Once Freya's daughter was murdered, she turns ice cold toward everything and everyone. She is immediately overcome by anger and hatred. Her entire body becomes a vessel for evil and wickedness. She finds her supernatural power in being able to literally freeze anyone and watch their bodies shattered as broken ice. This ability reflects her frozen heart and she feels nothing but disdain for anyone who loves. She sees it as a great weakness that should be eliminated. Freya leaves her sister's kingdom to establish her own domain. Freya conquers region after region in order to build a massive kingdom. She spares the lives of the children and brings them to her castle to train them as warriors. She also strives to eradicate love from their lives. As you may have guessed by now, Eric is one of the children she "captures" to train as a warrior. He and Sara, another child captured in the same raid, excelled as warriors. They also fall in love with each other, a sin punishable by death in the Ice Queen's kingdom. The Ice Queen forms an ice wall between the couple as their comrades carry out orders to attack and kill each of them. After watching Sara's murder through the ice, Eric is rendered unconscious and thrown into a river by his "adopted" brother. He survives, but ends up in the land of Snow White mourning the death of his beloved wife. 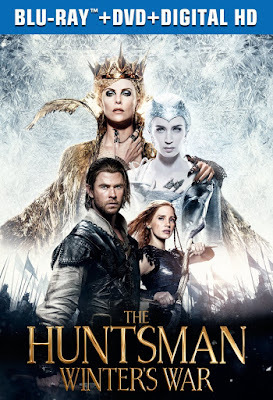 The Huntsman: Winter's WarTo be blunt, I liked this movie a lot better than it predecessor, "Snow White and the Huntsman". It is easy to accept Charlize Theron as the gorgeous queen whose beauty cannot be surpassed. As always, her performance was exceptional! How someone can be so beautiful, and yet be the face of evil at the same time, is quite fascinating. Emily Blunt was Freya and did an outstanding job of playing the part of a fractured soul struggling to survive an unimaginable experience. Her facial expressions throughout her reign as the Ice Queen revealed just enough to make you wonder if she struggled with her determination to extinguish any semblance of love. These two woman on the screen together are quite impressive. They are both beautiful woman with regal carriage. Their acting is superb, and their costumes in this movie are exquisite. To the naysayers of this movie who bemoan the fact that Kristen Stewart (Snow White) was not in this movie, I have to say I disagree. She was not needed, nor was she missed. 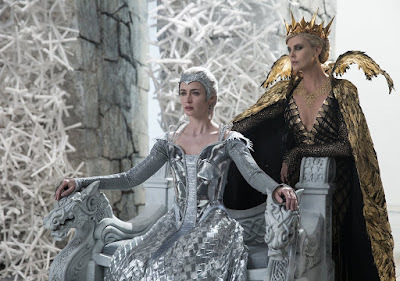 As far as the huntsman and the love story in this movie, Eric and Sara were easy to like. Their relationship and the evolution of romance shows that regardless of laws and hardships, people still care for each other. The human desire for love and natural response to love cannot be exterminated. I also really liked the ending of the movie, but you will have to go see it yourself to know what happens. Actually, you should go see it for yourself! Don't let the negative press and reviews that are just plain wrong keep you from going to this movie. What a wonderful review of 'The Huntsman: Winter's War'. I don't go to or watch many movies anymore and probably would have completely ignored this one if it weren't for your review. Now I want to know how the story ends. Great review. I think I will need to get this movie into my library of films that I like. I have not yet watched the movie but after reading your review I am now looking forward to watching it. I don't like to associate Theron with evil though but as long as the acting is great, I will definitely like it. Charlize Theron is my favorite current day actress. She amazes me at how she can take on any role and "become" that character. Like you, I don't like to see her as the face of evil, but she did an outstanding job with this part. What a good review! I don't think I enjoyed the first movie. In fact, if I tried to watch it I was not able to because I fell asleep. But this movie looked good in the previews and I had considered watching it. Thank you for the wonderful review. I didn't particularly care for the first movie myself. I had a hard time suspending enough reality to embrace Kristen Stewart as some great beauty. The biggest reason I liked this movie is because of the focus on human nature. A glimpse of how someone so sweet could end up so cruel and evil. You did a great job reviewing this movie. Unfortunately, you described it so well I know it would freak me out. I am sure more normal people will probably love it.